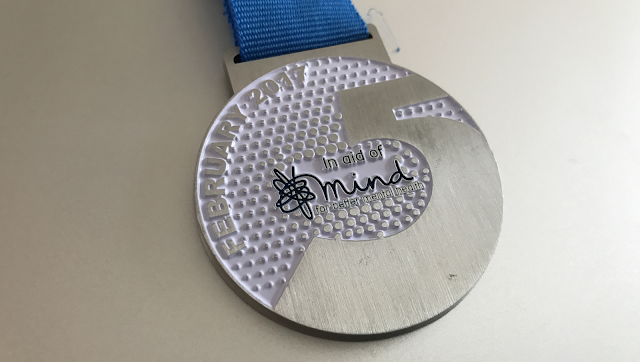 You may remember that in Ridiculous February I was planning to spend a lot more time in the pool - culminating in a 5km swim for the February Five challenge of doing something "five" related during the month of February and raising a bit of money for a good cause - Mind, the mental health charity. 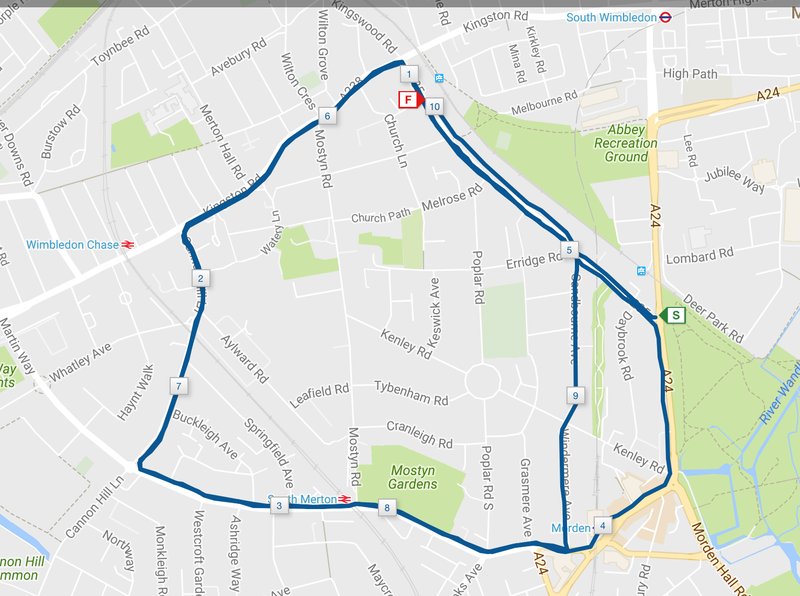 Running every day, the main objective of Ridiculous February, soon put that plan over the hills and far away, but I was annoyed I hadn't done it. Annoyed was joined by guilty when onto the front door mat landed my February Five completion medal. Well I had to do it now. In amongst running, meetings, and various other commitments it looked like this morning was the only day that would work. So I arrived at my local pool at 7:15am (though it felt very much like 6:15am thanks to the clocks "spring forward"ing overnight). My pool is 30m long, which is not a convenient factor of 5,000. I wasn't going to be attempting 5,000m non-stop, so had toyed with a few ways of chopping it up. I needed to swim 166.7 lengths, so I settled on 10x 16 lengths plus 1x 8 lengths to finish, with a minute break in between each set. A minute would feel like a long time at first, but I was fairly sure I'd need it at the end. The pool was virtually empty when I started. The first few sets went by quickly and consistently. A few others arrived, but never more than one other in my lane. After the fourth set I could tell I'd slowed a little, but I wasn't too concerned - there's no time target here, just completion. Pace drops off a little, and stroke efficiency (need more strokes per length), but no explosions! During the seventh set I was told off by the lifeguard for circulating clockwise in an anti-clockwise lane. That's a first. During the eighth set I saw the lifeguard and assistants making moves to re-partition the pool. I have never known a pool that continually moves lane boundaries around and sections off bits for various reasons with the frequency of this place. Sometimes you lose the whole shallow end and your lane suddenly gets 5 (or 6? or 4?) metres shorter - breaking any plan, and taking away an end to push off from. This time they left one full length lane and partitioned various bits of the rest of it - I'd have had a minor breakdown if my 30m length suddenly changed when I was so near to the end. Though they did manage to soak my towel in the process. With the final sets of 16 and 8 done, I was finished. During the last 16 my watch somehow gave me an extra length of credit, so my distance is logged as 5,070m rather than the 5,040m that I actually swam. February Five done, and with it a new personal best - I've never swum 5km in one go before! I left it a bit late in the month, finally completing it on February 54th, but I got there in the end. I can now remove the medal out of its little wrapper and take a proper look, it didn't feel appropriate to do so before. 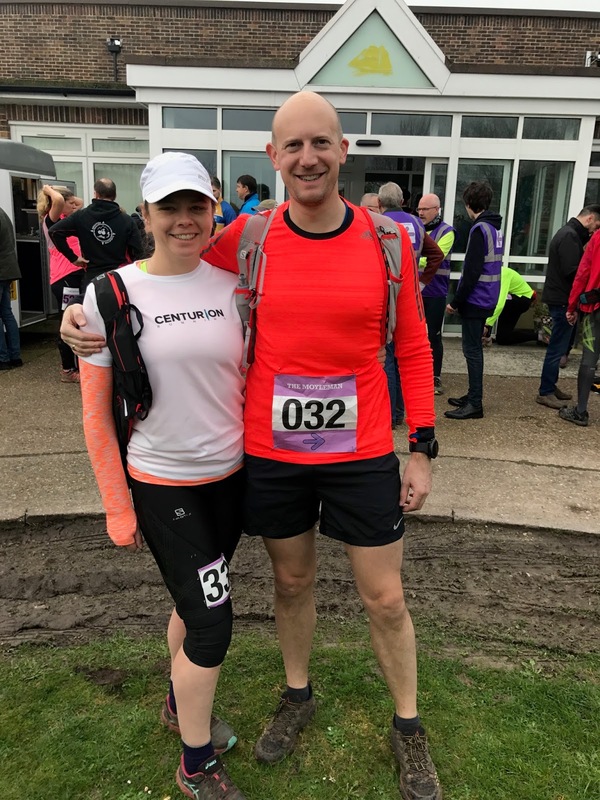 Thanks to the organisers and sponsor, Lee Merrett Wealth Management, for a different kind of motivation to get going in February (sort of) and for a good cause. Looking forward to next year already! 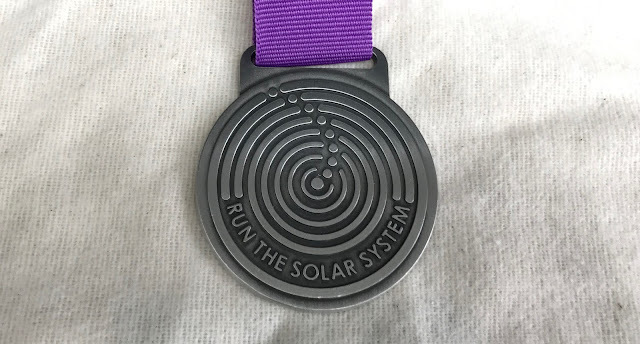 Announced earlier in the year, The British Science Association have held a virtual 10km running race this week called Run The Solar System. Sign up, download their companion app, and run 10km any time you like during British Science Week - from Monday 13th March through to yesterday, Sunday 19th. Entry is free, but for a £15 donation you can receive a special medal and membership of the British Science Association for a year - and I'm a sucker for a medal. Using the app you're taken on a virtual guided tour of the solar system, starting from the Sun and working your way out to Neptune (poor Pluto), roughly scaled to the 10km run. The journey is narrated at regular intervals by Dallas Campbell who bursts in every kilometre or so with interesting facts about the planets as you pass them. I learned a few things - I had no idea that Uranus spins on its axis almost at right angles to it's plain of rotation around the sun. This gives it "extreme seasons", with one pole being blasted by the sun for a few decades and the the other in permanent night, and then vice versa, for each of its 84 year long trips around the Sun. I also learned that one of Neptune's moons has a retrograde orbit - it orbits in the other direction to the other moons and opposite to the planet's direction of rotation. It was probably an interstellar wandering asteroid that was minding its own business got a bit close and became captured. Given that last week's Moyleman turned me into Limpy McLimpFace for a few days afterwards, I left it as long as possible through the week to run, finally getting out on Sunday afternoon. After a 2km warm up I hit the Start button and set off. After a week of limited running, apart from parkrun the day before, my legs felt good. As part of my year of PBs I wanted to break my fastest 10km time - I'm not sure if it counts given it's not a proper race, but it's worth a shot and I haven't run a hard 10km for a while. Setting off at about 4:50/km pace I managed to hold that for most of the way, despite a brutal headwind at times, and a couple of small hills. I two laps of a variant of my regular local 5km loop. I know the roads well and there aren't too many side roads and junctions to watch out for. Final time on my watch was 48:48, a minute and eleven seconds faster than my race PB. Now I just need to do it again at the Chatham Maritime 10k in a fortnight. Somewhat restrained bling by today's standards, but bling nonetheless! The only slight annoyance was that the app didn't automatically stop timing when I reached 10km, despite Dallas telling me congratulations, and I've finished and can stop running now. It took me ten minutes to look at my phone and realise I was still being timed, so my official time is 58:20! 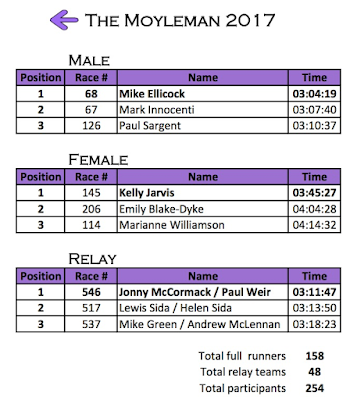 I ran the second half of this last year as a relay with Louise and loved it so was determined to come back this year and run the whole lot. It's also about the right time to take on a longer and more hilly race - and the South Downs is perfect as it'll make for some great terrain-specific training for the first of the year's Centurion 50-mile events, the South Downs Way 50, which is coming up in a month. It's easy to get to Lewes where the race starts and finishes, only an hour and a bit in the car, so no need to stay over the night before or after. The civilised 10am start helps. It was scheduled to be around 10C with a good chance of potentially heavy rain, so I opted for a thin merino long sleeved base layer with my bright Adidas mid layer on top. Shorts as always (unless it's sub-zero or there's lots of undergrowth), and my new most favourite shoes - La Sportiva Helios SR.
Mrs was running too, she had also run last year but pulled out at half way with stomach discomfort. We were both hoping for a good day in the hills. She was going for a long training run whereas I was out to treat it more like a race so we decided to start separately and meet at the end. I started well, running comfortably. I'm not really one for chatting while I run, so I was pleased that the field strung out quite quickly. I don't mind the odd "hello" or "good going" but I'm not up for a deep and meaningful or anything that requires too much thinking. The start was a gentle series of runnable climbs, then some lovely fast shallow downhills to open up into. The segment to the first aid station flew past. The sun was trying to peek through, the ground was damp enough to provide some light cushioning but with very little mud or slippery grass. Perfect. The first longer climb comes after aid station one, and is a fairly long slog. I ran the shallow part, but used my head and dropped to a hike rather than tire myself out for little benefit. On a clear day there would have been some good views from the top, but today was a bit misty so the horizon was a flat grey colour. My legs were feeling good, and I was running at an even pace, averaging about 9km/h which is a bit faster than my normal hilly trail pace of 7.5-8km/h. Annoyingly, I had started was sweating profusely from my head. I wasn't that hot although there was very little breeze, and I wasn't suffering from overheating in my body, but my head just wouldn't stop sweating - it was ridiculous. I realised the one thing I'd forgotten to bring was a buff to use for mopping! I reached half way in around two and a quarter hours - happy with that time. I ran the second half in 2:12 last year. I knew it would take longer this year having already run a hilly 13.1 miles, but I should be on for a finish under five hours. After the midpoint is the longest continual climb of the course, from sea level right up to some prominent transmitters on the very top of the Downs. I remembered this well from last year and was mentally prepared. Although I hiked at a good pace I found it hard to get my legs going once I'd got up there. I felt a bit light headed and took a big drink from my flask and ate my emergency nine-bar. In time, I got a second wind and picked up the pace again. The route drops back down in to the valley after about 30km, following a steep twisty road - the altitude it took 5km to gain lost in just 500m. I always try and make best use of downhills as I can, running them with effort (free speed!) rather than decelerating with every step - but this one was really punishing on the quads. A more level segment followed, and I told myself to keep running - I had slowed a little now but was determined not to walk apart from up hills. 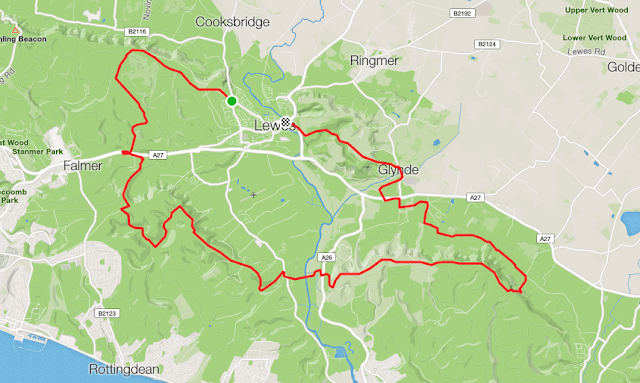 The course has a lovely sting in the tail in the form of a steep path up a field and hill side, then a punishing descent, followed by another more shallow climb, then a steep road descent again back into Lewes. The last few kilometres really could be a painful experience if you've overdone it previously. I picked up the pace through the town, and reached the finish two second shy of 4 hours and 52 minutes. 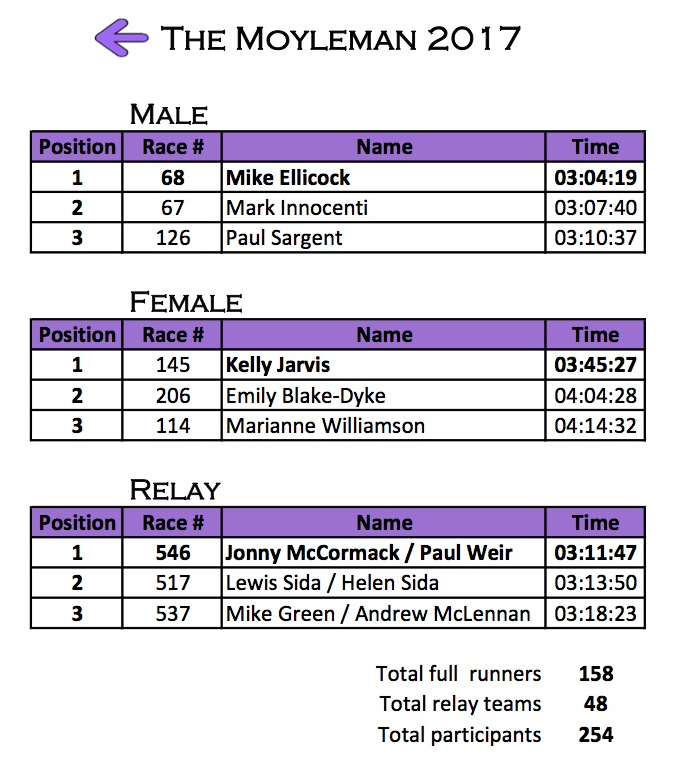 Comfortably under my five hour target, and happy to have ticked an early season marathon off - it's a good confidence builder. I've had some hard ones in the past and finished in quite poor condition (Seville last year springs to mind!) - so I was happy to finish still running and still in one piece. Seriously, how could my head even generate this much water?! Most races give you a bag of adverts and free samples of stuff you don't want at the finish - this race sets the bar a little higher with a free pint of beer and a free pizza! 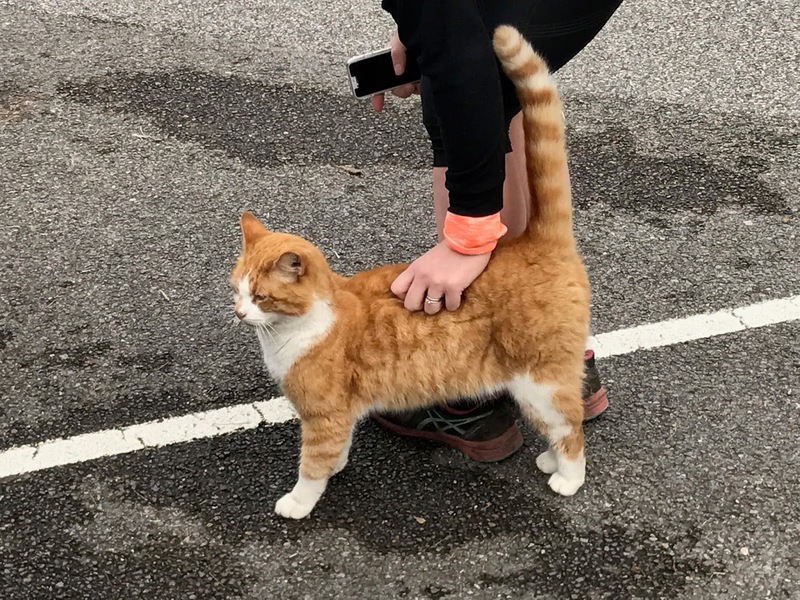 Outstanding, and exactly what I was looking for after almost five hours on the trail. In general the organisation was good - there were dozens of marshals out on the course, and no end of big purple arrows. The aid stations were water only and were a bit low on stock when I got there - I understand from later finishers that they ran out later on. That's inexcusable - it's the later finishers who are out for the longest time and will be most in need from the water stations. A mental note for next time, it is just water at the stops - don't expect food! Nothing like seeing the winning time to put things into perspective! I'm not sure where I came overall as the results aren't out yet. To be honest, I don't really care - I had a good day out, I finished well, and I got my free beer - what more do you need? I showed a much more consistent pace and cadence than I have done in the past. Now I just have to do it twice for South Downs 50! 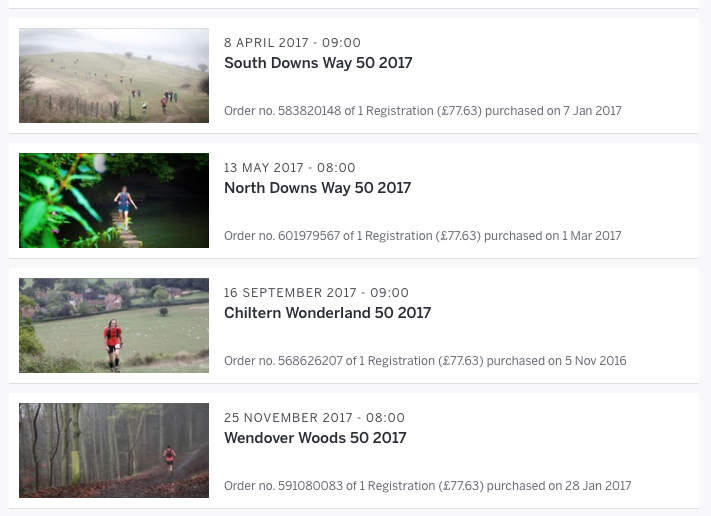 So I just got a waitlist place in the North Downs Way 50... The 50-mile grand slam attempt is on, I repeat the 50-mile grand slam attempt is on! 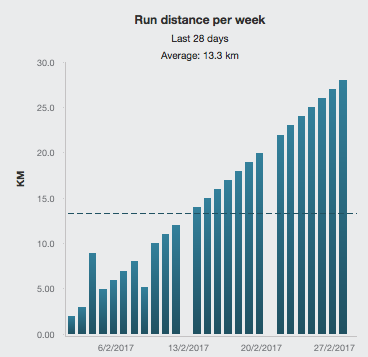 I challenged myself to a big and somewhat ridiculous February - getting some miles in the tank as a good base upon which to build for the races coming later in the year (suddenly, not quite so later either...). It started off OK (unsurprisingly, running 1km in one day is fairly straightforward), and during the first week it was trivial to hit the pool and sit on the turbo from time to time. I had three small wobbles over the month that resulted in missing two (and a half) days of running - but the turbo and swimming dropped off quickly. The first wobble came on the 9th when my good friend Matt came round to fit some connectors he'd soldered for me - I'd been struggling for literally two years to get it done, so we went to the pub to celebrate. After 4 pints, my 9km run detonated half way through. Apparently magic-beer-energy only lasts 4km, then it's all gone. I limped back home with my tail between my legs and claimed an "amber" in Training Peaks (session not completed, but at least you gave it a shot). The second wobble was the 13th when, after a few days of it building, I was finally beaten by painful toothache and had to get an emergency dental appointment. No running today. Session red. The third wobble was on the 21st, when (after being out the previous evening) I was in no condition to run! Session red. As I started getting into the teens, it got harder to do anything else - the fatigue was building up and it was all I could do to complete the distance the next day, without cycling or swimming too. On the plus side, I didn't miss any more days, and finished strongly on the 28th. As for races - no chance - I simply didn't feel like it. I didn't want to go out, tired, only to tire myself even more for the next day. Swimming and biking started well, but as noted dropped off fairly quickly. Needless to say, I failed to take on the February Five challenge I'd set myself of swimming 5km (where do I get the idea I can do all this stuff at once?). This puts me in a bit of a quandary as the organiser had already sent me the medal. I'm going to give it a shot tomorrow morning, and hope nobody notices I didn't do it in February! If I don't make it, I'll have to leave the medal in its sealed bag until next year. In summary, I'll give myself a grade B for the running challenge as despite missing a couple of sessions I am still particularly pleased to have completed all the longer days; and a grade D for everything else - a good start, but bitten off more than I could chew. I've been wanting to try the ramping-up month for a while, I'm looking forward to a future second attempt.